The Double Reed Workshop focuses on the fundamental principles of double reed performance and includes specialized classes in reed-making techniques. The Clarinet Clinic focuses on the fundamental principles of clarinet performance and is open to students entering grades 7-12. The Flute Workshop will focus on building performance and musicianship skills and is open to students entering grades 7-12. The Saxophone Workshop focuses on fundamentals, playing techniques and performance practices. 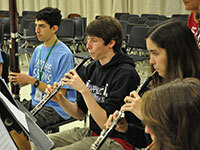 Students participate in large ensembles, chamber groups, masterclasses and more. The Brass Camp focuses on the fundamentals of performance and practice for brass instruments. The String Institute focuses on playing techniques, orchestra and ensemble rehearsal, performance and master classes. Please refer to the individual workshop pages for registration forms, deadlines, and tuition costs, as these vary by workshop.